Hey guys.... wanted to share this with you. I have debated over and over about upgrading from my x58 990x Bloodrage to something newer but... it just keep kicking. Today I upgraded to a Samsung 950 Pro for my boot drive. I have like once I saw it worked. I installed it via PCIe. Mobo recognized it right away. I went into windows on my old Corsair GS and installed the samsung drivers. Then I used Samsung migration tool and cloned it over. I unhooked my corsair ssd and booted with no problems. 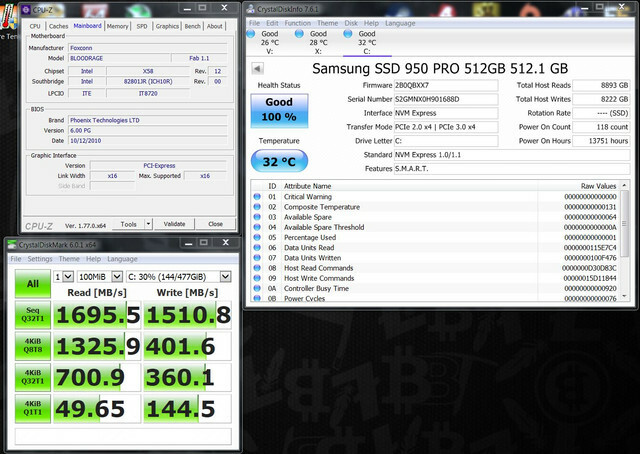 It is not as fast as rated speed but it beats the 450 read/write my corsair did with a PCIe addon card.